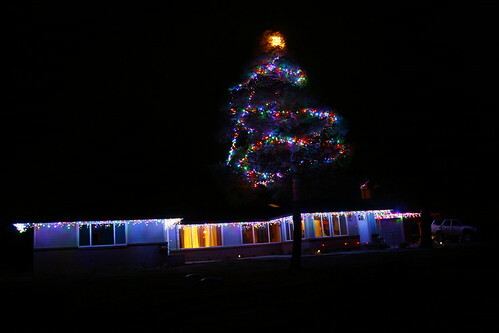 The outside x-mas tree is all lit up! This is our first Christmas at the new house! We've never really decorated much at the places that we rented, but I really wanted to do something cool. The first thing I did over this weekend was put up the multicolored icicle lights along the roof eaves. When we bought the house, there were a bunch of small hooks on the underside of where the roof hangs over. I didn't really know what they were for, but Shelby told me that they were for Christmas lighting. Over the summer, I was using them to hang bird feeders, but now I used them to string the icicle lights up. However, the hooks didn't go all the way around the house, so I went to Home Depot and bought a big pack of the little screw in hooks and finished off the rest of the house. Once all the icicle lights were done, I had a bunch of left over lights. 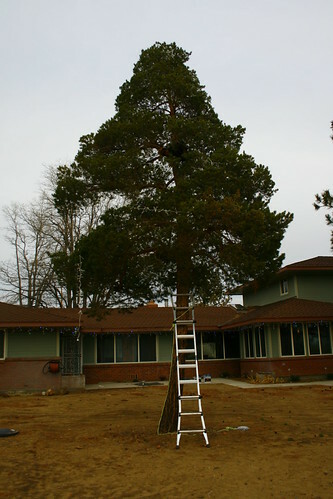 I got the idea that we should decorate the big pine tree in front of our house instead of having an indoor xmas tree. Plus you can see that tree from all around, so other people will see it all decorated too. When I told Romy my idea, he said I was crazy and that it would not be possible to get up the tree and that it would be a waste of time. But I was super determined! Can you see me up there? !I'm about 3/4 of the way up. Not even Romy could discourage me from decorating the tree. I dragged him to the store where I bought a lighted star for the top of the tree. Then I went upstairs to where our rock climbing stuff is in the closet, and pulled out my climbing harness, carabiners, and a bunch of webbing. 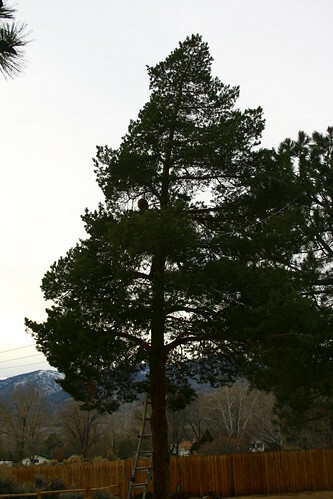 We put the ladder up the the tree trunk and conveniently, it was high enough (13 feet) to reach the bottom branches. I started climbing, and as I went, I moved the webbing up the truck. There were a lot of strong branches, so I really didn't need the webbing, but it was really nice to have it at the top where I rested and hung off it while I positioned the star at the top. Once the star was on the top, I connected it to the string of LED lights and threw them down to Romy, who was on the ground ready to start whipping the lights around the tree. It was a lot harder than I thought initially to get the lights to wrap around the tree, but we did the best we could given the branch pattern of the tree. I like how it turned out! I don't often post on the blog, yet I do enjoy looking back at the entries to see what we were doing. I realize that's only a small glimpse, and it's always Jenn writing. I think I may attempt to write more so in the future there's a more complete story. And so, onward! What prompted this entry was seeing a Gif of a Star Wars recap. It's that there Gif below. This got me thinking - the Gif would probably not make too much sense to someone not familiar with the story, but for those who are, it's cute. I used to watch the original Star Wars movies often. I read many of the books, played video games, just generally immersed myself in another world. It took me away to a fantasy realm where ridiculously neat things were possible. I liked going there, even if for a short time, and I thought I would always have the same obsession or draw to it; I thought it a permanent thing. But I haven't watched it now in years. I still know the story, the characters, the plots, and, in the better stories, the double meanings ans symbolism. I've tried to revisit it actually. I read a novel somewhat recently, but the magic I had known previously was lost. I really tried to get into it, but the story was just not consuming. When I was younger, I could never understand certain older folk who took little interest in new movies; it was all the same thing they would say. They'd seen it before. I couldn't believe them at that time - how could you have seen a new movie before? But I realize now they were right. New movie, but a rehash of an old story. Let the mild gloating commence from those certain older folk. And so what this Gif that I just watched has done for me is made me realize (or re-realize and cement) that life keeps moving on. It's a progression. And I don't think it's a good thing to stagnate in one stage of it for too long. Progress onward, find new things, learn stuff and try stuff. I guess everything really is temporary if your timescale is long enough. 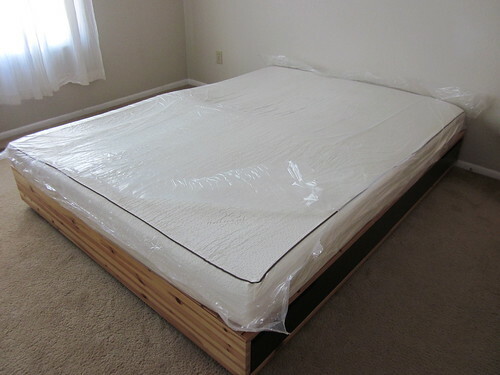 Finally, We Have a Memory Foam Mattress! 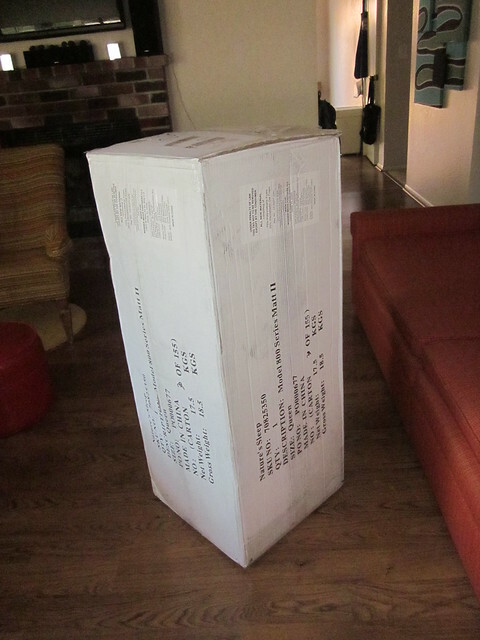 The mattress came in a modest size box, but weighed a ton! Until a Groupon popped up in my e-mail where there was a deal on buying a memory foam mattress online at Nature's Sleep. It caught my eye so I opened it up. 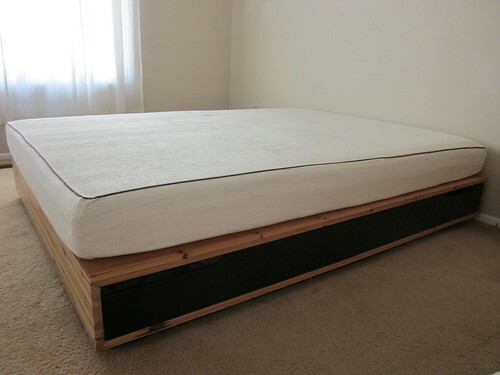 It was a deal for 75% off any memory foam mattress on their website! So I read some reviews to see if it was good or not, and they all seemed positive. Most people gave the mattresses five stars. So I went for it and bought the Groupon! Inside the box was a tightly rolled mattress! I bought the Groupon on a Saturday morning. I ordered the mattress on Saturday night. Then it got shipped out on Monday morning, and Tuesday afternoon it arrived! Woah was that fast! I thought it would come in two weeks. It came basically in two days! 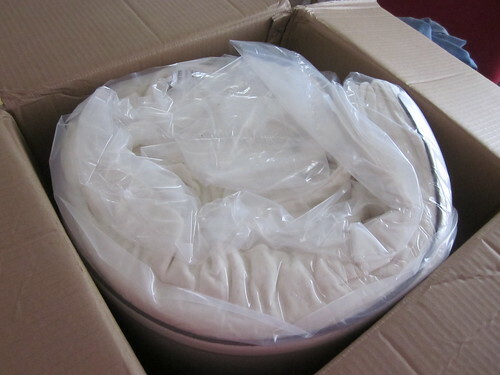 What's interesting is that I never thought a whole mattress could be shipped by FedEx. So I took a bunch of pictures of the unrolling and plumping-up process! 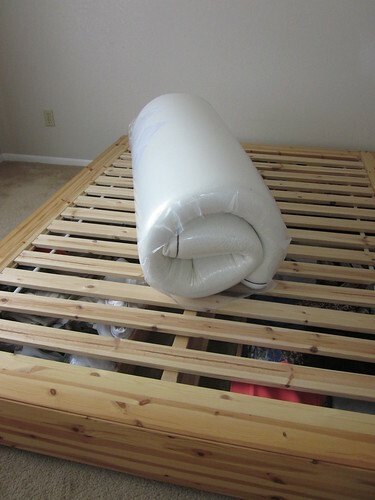 The mattress came out of the box tightly rolled up in plastic. First I had to drag the box from the front door to the bedroom. This was like dragging a dead body, but I muscled through it. Next I carefully cut the box open to reveal a rolled up mattress! The one I ordered was a queen size "St. Bart" which is an 8 inch mattress that is semi-firm. 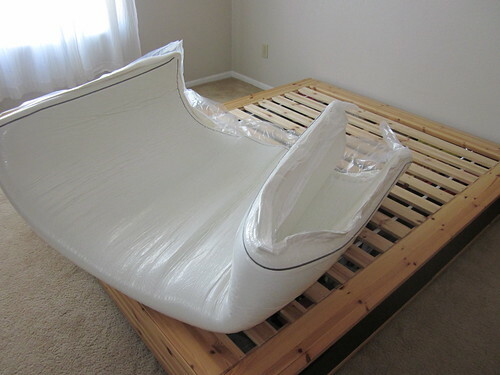 After cutting the outer plastic, the mattress started to expand all by itself. The rest of the pictures show how the unpackaging process went. It was surprisingly fast! The whole thing plumped up in less than 5 minutes, but the packaging said that it will take up to 24 hours to fully plump up. It came with two sheet already on it. There is a covering that goes over the foam, and then there's a removable velvet cover that zips on and off. I can't wait to sleep on it. I am not even sure if I should put some sheets on it or not, but I think I will. The mattress was actually folded in half! LOL! Now its lying flat, and its time to cut open the plastic covering. With the packaging cut open, it started sucking in air very fast!